Hidden in one of the darkest corners of the Orion constellation, this Cosmic Bat is spreading its hazy wings through interstellar space two thousand light-years away. It is illuminated by the young stars nestled in its core — despite being shrouded by opaque clouds of dust, their bright rays still illuminate the nebula. Too dim to be discerned by the naked eye, NGC 1788 reveals its soft colours to ESO's Very Large Telescope in this image — the most detailed to date. 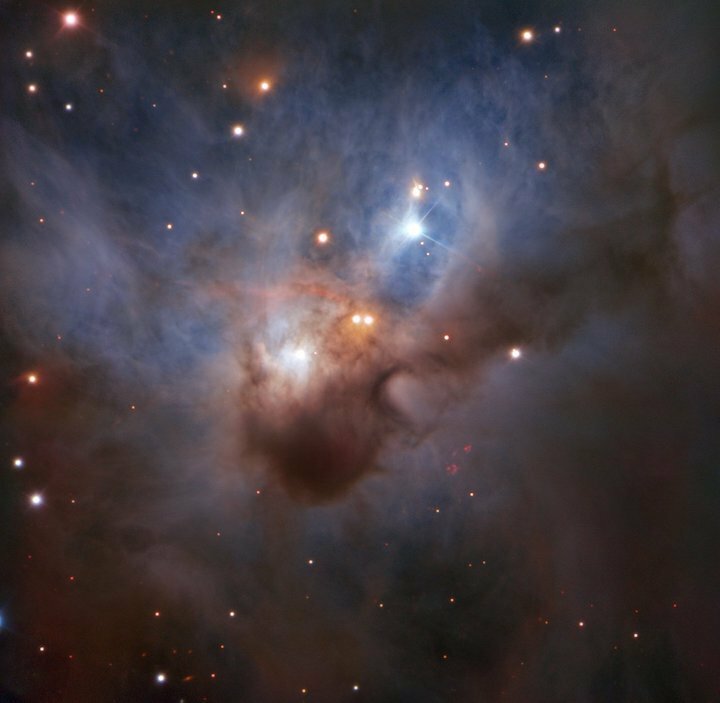 ESO's Very Large Telescope (VLT) has caught a glimpse of an ethereal nebula hidden away in the darkest corners of the constellation of Orion (The Hunter) — NGC 1788, nicknamed the Cosmic Bat. This bat-shaped reflection nebula doesn’t emit light — instead it is illuminated by a cluster of young stars in its core, only dimly visible through the clouds of dust. Scientific instruments have come a long way since NGC 1788 was first described, and this image taken by the VLT is the most detailed portrait of this nebula ever taken. NGC 1788 was first described by the German–British astronomer William Herschel, who included it in a catalogue that later served as the basis for one of the most significant collections of deep-sky objects, the New General Catalogue (NGC). A nice image of this small and dim nebula had already been captured by the MPG/ESO 2.2-metre telescope at ESO's La Silla Observatory, but this newly observed scene leaves it in the proverbial dust. Frozen in flight, the minute details of this Cosmic Bat's dusty wings were imaged for the twentieth anniversary of one of ESO's most versatile instruments, the FOcal Reducer and low dispersion Spectrograph 2 (FORS2). FORS2 is an instrument mounted on Antu, one of the VLT's 8.2-metre Unit Telescopes at the Paranal Observatory, and its ability to image large areas of the sky in exceptional detail has made it a coveted member of ESO's fleet of cutting-edge scientific instruments. Since its first light 20 years ago, FORS2 has become known as “the Swiss army knife of instruments”. This moniker originates from its uniquely broad set of functions . FORS2’s versatility extends beyond purely scientific uses — its ability to capture beautiful high-quality images like this makes it a particularly useful tool for public outreach.